The trade fair Automatica will be hosting additional programmes that will provide further insights into the latest trends of the industry. The display areas and live sessions are expected to educate visitors about future technologies. Welcome to Automatica 2018 – The future of manufacturing can be witnessed right here! With a strong focus on smart automation and robotics, the leading event is scheduled to be held from June 19–22, 2018 in Munich, Germany. Currently, artificial intelligence is gaining traction all over the world and to support this trend further, Automatica will be showcasing many supporting programmes to enable visitors explore this segment. This will include numerous intelligent technology displays along with insightful seminars. A dedicated area to witness robots that can help us in our daily household chores can be seen here. These robots can be used across retail, logistics, medical, cleaning, agricultural, and security applications. For instance, KUKA has recently come up with its latest service robot called ‘i-do’. The user-friendly mobile robot can click your pictures and also carry your coffee for you. Similarly, the live demonstrations of many other interesting service robots and cobots will be showcased in this space. Often referred to as the fourth industrial revolution, Industry 4.0 is creating factories of the future. Some of the core elements of Industry 4.0 include automation, data exchange in technologies, internet of things (IoT), cognitive computing, and many more. New business models in the form of platforms and ecosystems are the latest addition to this clan. But what are platforms and ecosystems? It is simply the collaboration between companies and trade associations or research institutions to create innovative technologies and solutions. Today, we are witnessing an increase in such associations as companies want to be at the top of their game. Human-robot collaboration is another segment that will be emphasised in this section. Here, the advantages of human-robot collaboration will be displayed via cobots. 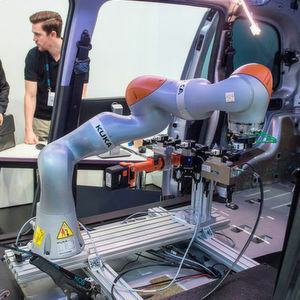 Recently, the industry has seen numerous cobots sprouting such as KUKA’s smart and flexible cobot – the LBR iisy, the single arm ‘Yumi’ cobot by ABB, the cobot introduced by the South Korean player Doosan through which it announced its entry into the cobots segment some time back, etc. At the event, one can expect to see live demos of many other cobots.